This 100% polyester sheer shell and pale cocoa-bone slip lining dress is by Speechless and was made in the USA. It has gold metallic thread accents on the little circles design pattern. 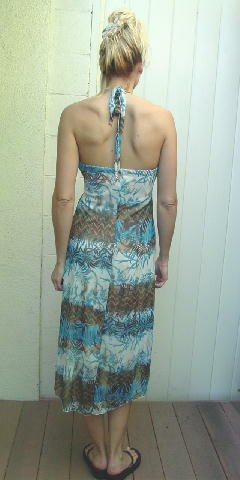 There is a lightly padded bra and the dress has a tie halter styling. The front has a horizontal gathered fabric 2 1/4" area with a 2 1/4" high by 2 1/8" wide doubled fabric loop. The front has a 2 1/2" wide (all-in-one) vertical fabric center which gives the front side some fullness. The front curves upward in the center from the sides and the back curves downward in the center, making the back center 10 1/4" longer than the front center. It has a design pattern of leaves and a zigzag pattern of the gold metallic accent circles. 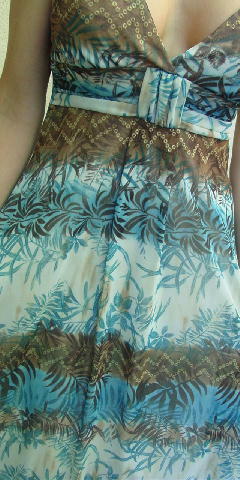 The dress is in pale bone, blue, and various shades of brown. The tag says size M, but it fits more like a size 6. She wore it to a cocktail party in the Caribbean and one in Palm Beach. shoulder to shoulder (horizontal gathered area) 26"
top front center to bottom center 27 1/2"
top back center to bottom center 38"
armpit to bottom side hem 34"